Diploma Plus, Inc., a 501(c)3 organization, headquartered in Boston, seeks to develop, implement, and sustain, in partnership with school districts and communities, innovative educational approaches and small secondary schools that provide rigorous and student-centered alternatives for youth who have been failed by the traditional system in order to nurture their power as learners and enable them to complete high school, college, and career-ready. The core of the Diploma Plus model centers on the establishment of a competency-, performance-based systems in public high schools. Diploma Plus has built its capacity to provide rigorous and student-centered alternatives for high-need youth since 1996. Diploma Plus was founded as a 100-student pilot initiative with two community-based organizations, supported by the Charles Stewart Mott Foundation and a handful of Boston-based funders. The potential of the model attracted considerable attention, and in 2003 the Bill and Melinda Gates Foundation provided funds to support replication in 10 schools in New England and NYC. With encouragement and advocacy from the Gates Foundation, Diploma Plus became a founding member of the Association for High School Innovation. The initial success of this replication led to additional investments by the Gates Foundation and national and regional foundations to extend the work to 12 additional schools in New England, NYC, and California, and the opportunity to form a strong partnership with The Mind Trust, a well-noted non-profit devoted to developing and expanding transformative education initiatives. A wide range of private philanthropies have invested in bringing the model to greater numbers of youth. 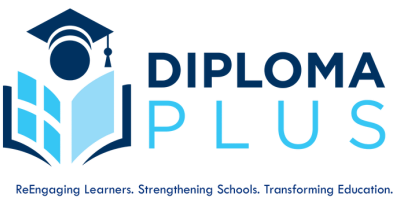 Funders have been positively impressed with Diploma Plus' reliability, timeliness, and deliverables; specifically, the Gates and Mott Foundations have shown their confidence in Diploma Plus' capacity to improve educational outcomes by funding Diploma Plus' work for multiple grant cycles. Diploma Plus was the only national organization named in the November 2010, When Failure Is Not An Option: Designing Competency-Based Pathways for Next Generation Learning, publication by the International Association for K-12 Online Learning. Featured recently in the American Youth Policy Forum’s publication, Success at Every Step: How 23 Programs Support Youth on the Path to College and Beyond. Featured as a New Effective School Option in the National Governor’s Association, “Achieving Graduation for All: A Governor’s Guide to Dropout Prevention and Recovery”. Selected by the National Dropout Prevention Center/Network as a “model” program. Included in President Obama’s pre‐election Plan for Lifelong Success through Education as one of two “Evidence‐Based Models to Help Students Graduate”. Selected as one school turnaround model for Indianapolis, Denver, Baltimore, Newark, and Nashville. In August 2010, DP was named as an exemplar program in the publication, Transitions – Preparing Students for Life after High School, by the National Association of State Boards of Education.